10% of the net proceeds go to support the animals of Rivers Critters Ranch. 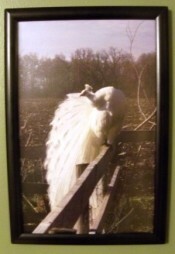 This 11” x 17” poster features Lucas, one of our white peacocks. This photograph caught him in a peaceful moment as he gazes across the fields. It is printed on a 10 pt. card stock with a soft gloss finish which features an AQ (aqueous) coating. The poster is accompanied by a Certificate of Guarantee. 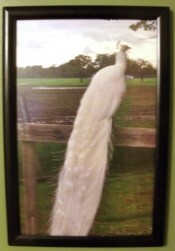 You can purchase this "Peaceful Moment" framed by clicking here. Thunder booms in the distance. A storm is coming. Before it breaks, Lucas, quiet and reserved, sits. He waits; basking in the last peace of the evening. The stale, thick air of the day is gone, replaced by a smooth coolness that brushes his feathers. Lucas has watched many squalls come and go, these last few days, dampening the budding corn, and wetting the land. He wonders when the land will be rich with the smells of first summer, bright with the true green that signals it is time; Time to run free in the fields, climb high in the trees, and breeze over the land. 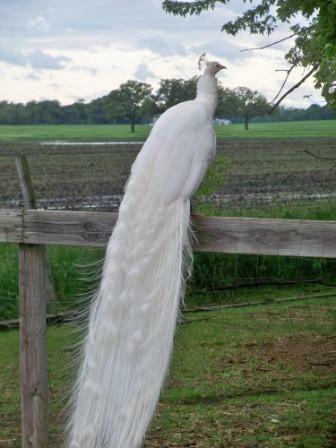 He wishes for a bright day, one that allows him to show off his train, perhaps catching the eye of a peahen. He hopes for the tasty first fruits of summer, that he may pluck them fresh from their vines. Lucas wonders if he tomorrow will be a day for hunting bugs. Soon, he thinks. Soon. The farmer has come and gone now, putting away the rest of his flocks. Alone, Lucas sits. Waiting. It is a peaceful moment, the last of the day. 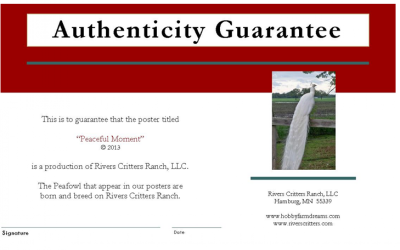 The poster is accompanied by a Certificate of Guarantee that is signed by one of the owners/operators of Rivers Critters Ranch. On the reverse side of this guarantee you will find a story about Lucas. Posters are framed in a slim profile black matte frame which features a snap opening that is easy to use. It can be mounted in the vertical or landscape position and includes the required screws and anchors for hanging. The frames overall dimensions are 12 3/16" x 18 3/16" with the visible are of 10 1/4" by 16 1/4".